Opening this weekend is the animated film Hotel Transylvania. 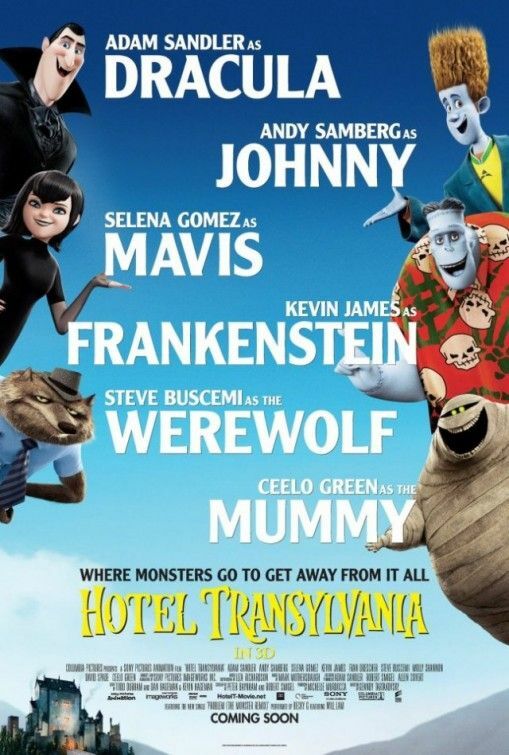 Directed by Genndy Tartakovsky (Samurai Jack), the story centers on Dracula (voiced by Adam Sandler) trying to throw a party for his daughter Mavis’ (Selena Gomez) 118th birthday, but his plans go haywire when a human (Andy Samberg) comes to the monsters-only hotel and develops a crush on Mavis. The film also features the voices of David Spade (Griffin the Invisible Man), Steve Buscemi (Wayne the Werewolf), Kevin James (Frankenstein), Molly Shannon (Wanda the Werewolf) and Cee Lo Green (Murray the Mummy). For more on the film, here’s six clips and all our previous coverage. At this year’s Toronto International Film Festival I got to speak with Samberg and Gomez. During our very loose interview, we talked about how they got involved in Hotel Transylvania, the recording process, how things changed during production, and more. In addition, we joked about future touring plans, how this year’s Oscar race is be between The Master and Hotel Transylvania, Samberg’s upcoming BBC show Cuckoo, and Gomez talks about Feed the Dog which she just finished filming. Hit the jump to watch.